The above link is for the two-disc extended cut of the film on Blu-Ray. Excellent! Ghost Rider (2007): I really enjoyed this movie. It was fairly faithful to the comic books; not that that always matters. But I do like it that it followed the basic character concept of Ghost Rider. This is a cool character. 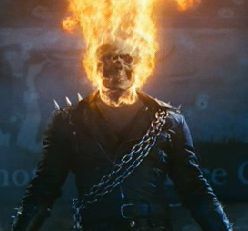 And for a real surprise, Nicolas Cage was actually GREAT as Ghost Rider. I'm not a huge fan of Cage's work. To be truthful, there aren't many of his movies that I like. But, amazingly, this suits him. Cage actually has claimed to be an avid comic book reader, and considers superheroes to be the Greek mythology of our time. I know he's right, so maybe it was that passion that made him such a cool actor for this role. Eva Mendes as Johnny Blaze's (Ghost Rider) girlfriend Roxanne Simpson was a nice touch. She's funny and not an unnecessary pain in the a** like some women in superhero shows can be. Peter Fonda as Mephisto, the Devil, is way cool. This is one of Peter's best roles, easily. He's perfect at playing the brooding, evil types. Blackheart, son of Mephisto and enemy to both Mephisto and Ghost Rider, is irritating. Wes Bentley does a great job playing this character, but I'm glad the character gets killed. You just WANT to see him "get dead". He's not a likable villain. Last, but not least, is Sam Elliott as Caretaker, who we find out was the Ghost Rider BEFORE Johnny Blaze, back in cowboy days. The cowboy Ghost Rider is really cool, and the fiery horse is a neat effect. It's a simple story, which allows for a really great showing of wild, unpredictable special effects. The action scenes are very no-holds barred. I would think that this movie is a dream come true for anyone interested in the Ghost Rider character.